We can offer full Maintenance packages to suit all operator requirements (UK only), whether it is a one off Service and inspection or a fixed service contract then we can accommodate accordingly. MOT prep and presentation can also be provided to all potential new and old customers whether you have purchased a truck or just need a one off MOT. 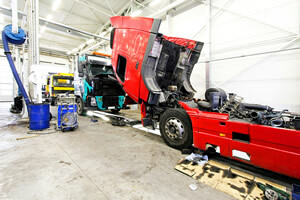 We have full computerised Vosa brake testing facilities on site giving you printed readings. Major repairs are also carried out from Clutch replacement's, Brake/axle overhauls, Engine faults are just a few of the services we can offer. All parts are sourced from our select choice of suppliers at competitive rates giving you the best prices available. Should you require any further information call us on 07823 773983.